An Brú has been the official Irish form of Bruff since 1969. 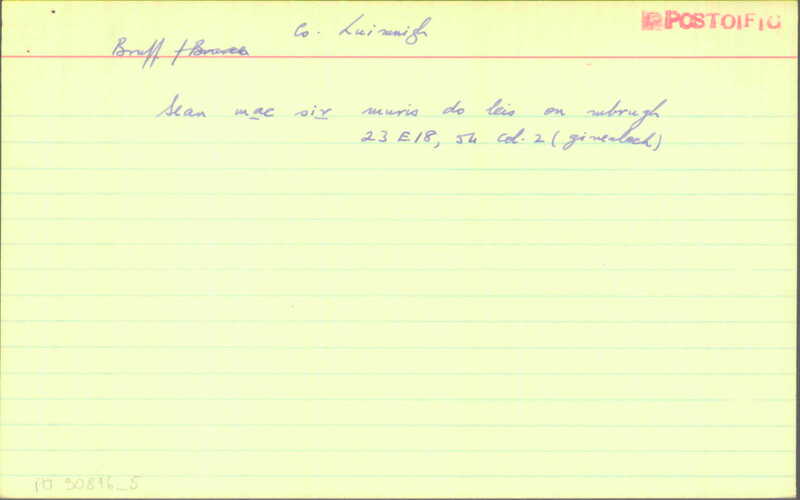 It was included in the book Ainmneacha Gaeilge na mBailte Poist which was published in that year. That publication gave the official Irish language names of the post-towns of Ireland which had been decided on the advice of An Coimisiún Logainmneacha (The Placenames Commission), based on research of written sources and local evidence which had been undertaken by An Brainse Logainmneacha (The Placenames Branch). Provisional Irish forms of the post-towns were published prior to that. The provisional list for Co. Limerick was published in 1960, where An Brú was also given as the Irish name of Bruff. One of the reasons for the publication of a provisional list was to give the public a chance to recommend changes to the Irish forms. There is no evidence to show that the Irish name An Brú was queried at that time. 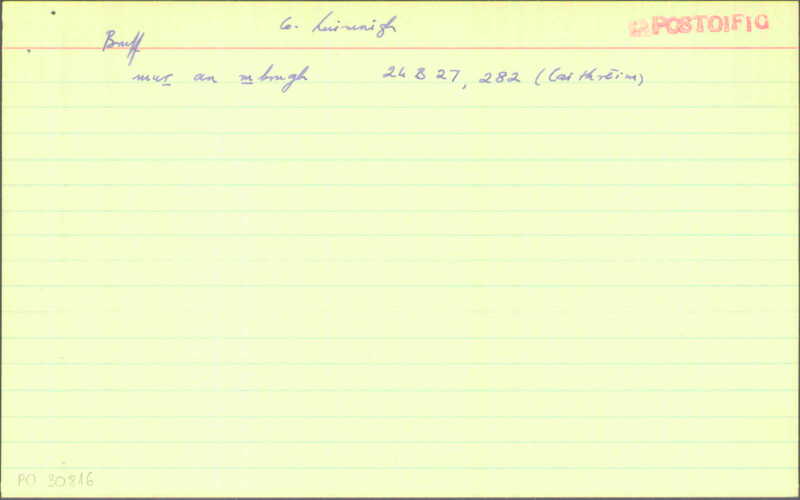 An Brú was subsequently given legal status by the Minister for Finance in the Placenames (Irish forms) Order 1975, under the provisions of the Placenames (Irish forms) Act 1973. 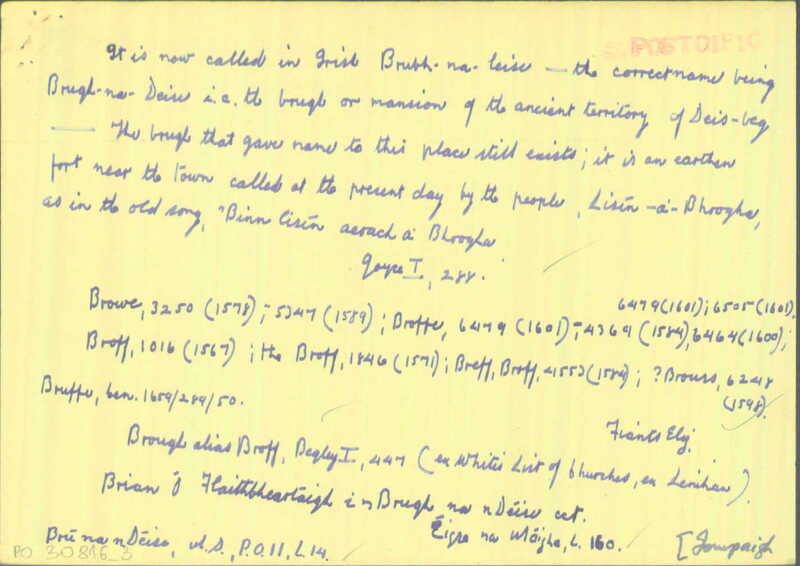 The name An Brú was given equal legal status with the English name Bruff by the Minister for Community, Rural and Gaeltacht Affairs in the Placenames (Co. Limerick) Order 2003, under the provisions of Part 5 of the the Official Languages Act 2003, which replaced the Placenames (Irish forms) Act 1973. 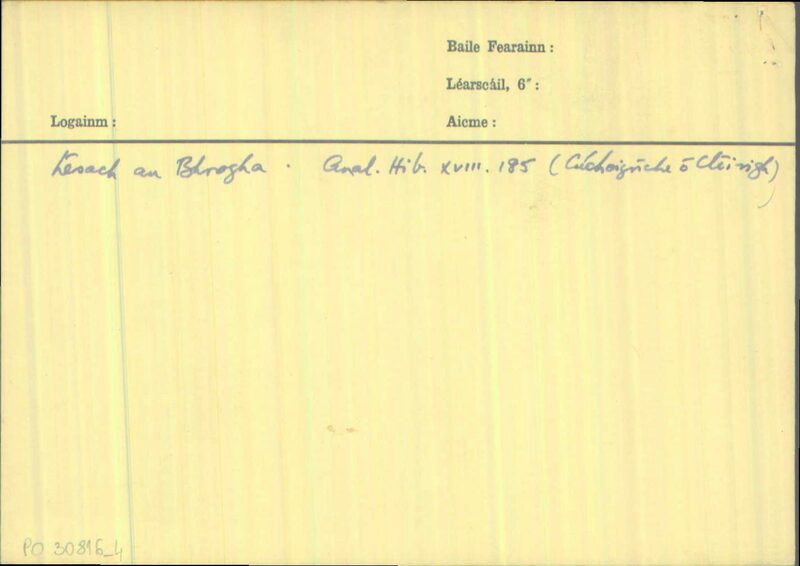 The historical evidence for the Irish name An Brú was published in the book Logainmneacha na hÉireann, Imleabhar I, Contae Luimnigh (Ó Maolfabhail, 1990). This shows that Bruff is referred to in various Latin and English documents from the beginning of the thirteenth century onwards. In these documents, the placename is written as a simplex i.e. as one word without further qualification: hence, Brug (1200), Browe (1542), Broff (1579). There are also some historical examples of the name in Irish literature. The article An precedes the word Brugh (and variants) in the Irish versions, such as ‘mar an mBrugh’ (a poem composed about 1580c), ‘ón mBrobh’ (an Irish manuscript written in 1832); ‘Binn-Lisín aerach an Bhrogha’ in a well-known poem composed by Brian Ó Flaitheartaigh from Bruff in the eighteenth century which means ‘the sweet Lisín (little ring-fort / enclosure) of Bruff’. 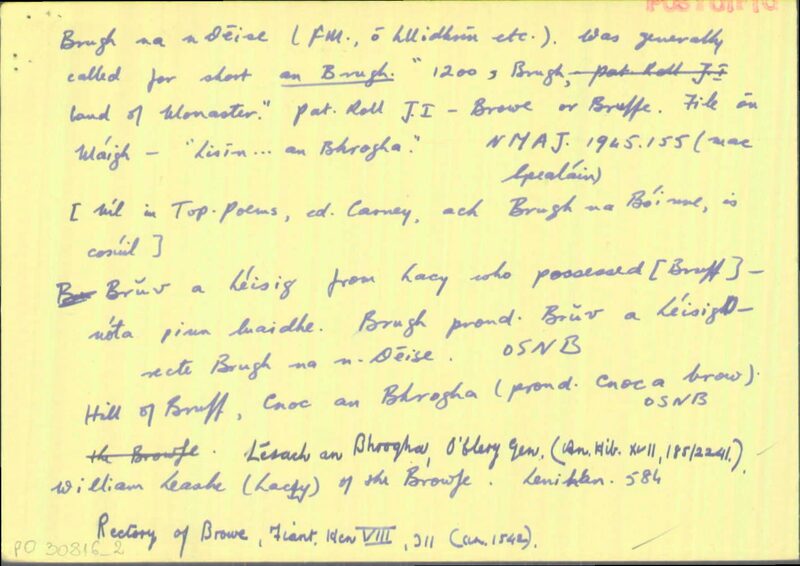 There is also a reference in Irish genealogical material to ‘Lésach an Bhrogha’ referring to one of the de Lacy family from Bruff. The de Lacys were an Anglo-Norman family who settled in this area. There are also a few examples in Irish of an extended form of the name. There is a reference for instance in an early eighteenth century prose text to ‘Lúsía de Léaci, bantíagharna Bhrogha an Léisicc’ (Lucy de Lacy, the Lady of Bruff) (see Historical Dictionary of Gaelic Surnames for a precise reference). That extended form corresponds to Brú an Léisigh in modern orthography. At the time of the first Ordnance Survey in 1840, the Irish name of Bruff was written as follows in the Ordnance Survey Parish Namebook, Bruv a léisig, Brugh a léisig, B. na nDéise. The last-mentioned name is more than likely a corruption of Brú an Léisigh, pronounced *Brú an Léise, where the ‘l’ sound changed to ‘n’. 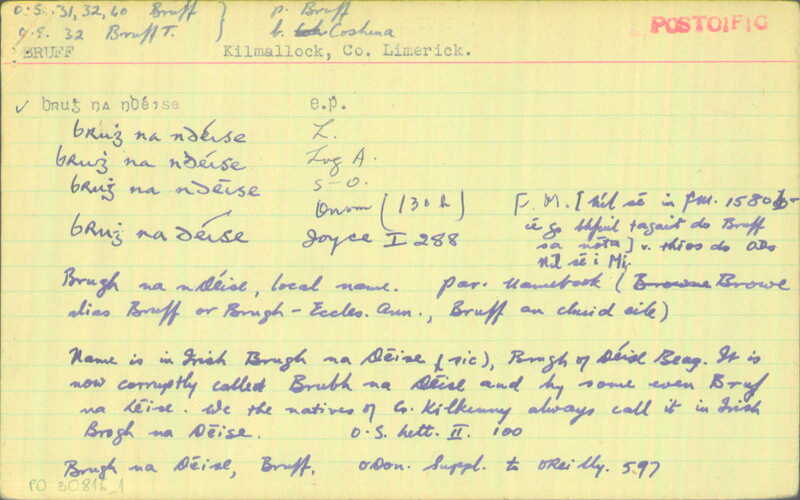 Brugh na nDéise subsequently appeared in an influential book entitled Post-Sheanchas by Seosamh Laoide which was published in 1905 and this form of the name became popular through its use in schools probably. Tá postoifig anseo nó bhí tráth.